Stewart Ford came into this July 1992 game and finished what his starter began. What Ford finished for rookie Idaho Falls was a no-hitter, according to MiLB.com. Ford came on in relief of starter David Pike July 19, 1992, and closed out the no-no. The final score in the game was Idaho Falls 3, Medicine Hat 0. Ford got the save. Ford saved that no-hitter in his third season as a pro. He couldn't extend the success he showed in saving that no-hitter. That season ended up being his last. 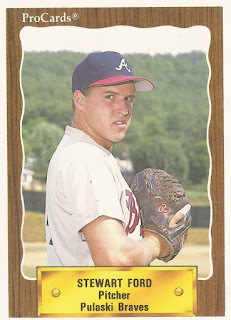 Ford's career began in 1990, taken by the Braves in the 22nd round of the draft out of Ranger Junior College in Texas. He played his high school ball at Austin's McCallum High. At McCallum, Ford is counted among the school's Hall of Honor. Ford started with the Braves in 1990 at rookie Pulaski. He got into 15 games for the club, all in relief. He ended with a 6.20 ERA. His ERA was bettered a bit with a scoreless inning to close out the season in September. Ford returned to Pulaski for 1991. He got into 18 games that year, with a 4.42 ERA. He picked up one win and two losses. His third season came at Idaho Falls. The reliever got into 27 total games, saving three and taking two losses. He ended with a 6.18 ERA. It was his final season as a pro.